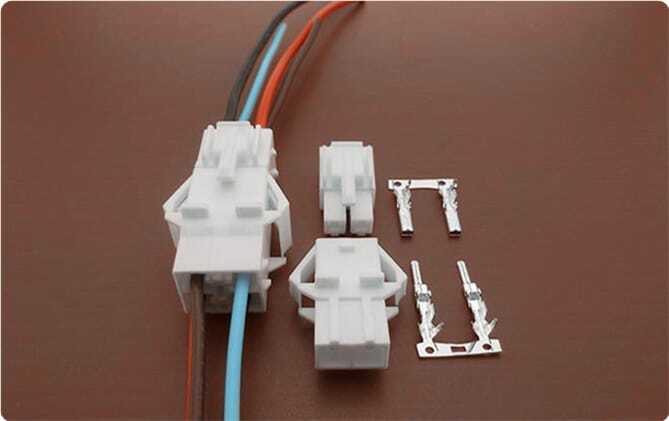 SCT6201 Series are compatible with Molex VersaBlade 6.2mm pitch series wire to wire connectors. Scondar offers SCT6201 Series, a replacement and cheaper alternative of the Molex VersaBlade L6.2mm pitch wire-to-wire connector. Scondar SCT6201 comes in a complete package: The male housing, female/receptacle housing, female and male terminal, all manufactured with precision-fitting and durability ensuring accurate mating. Scondar’s 6.2 mm Pitch connector is composed of the wide flat blade tab terminals (1.78mm), multi-configured modular housing and terminal position assurance inserts for modularity and design flexibility in many applications. Also, Scondar showcases other features such as positive lock and TPA secondary lock, single row system and spring style mounting ears. The SCT6201 is compatible with AWG 14-22 wire and can handle 4 to 15 amps and 300 volts, depending upon the design characteristics. With this capability, this provides you to use it to connect both signal and power. WIth a molded dimple, Scondar can offer reliable mating of connections. The dimple will serve as a visible mating guidance for its ease of assembly, and will prevent connection misorientation. The 6.2mm pitch wire connector also offers harness design options for design flexibility according to your needs, and features Easy Harness Assembly to reduce time and cost during installation. An optional snap-in mounting ears enables the connector to be configured to panel-mounted, feed-through types of connections. The support for high voltage and current (300V/15A) features a more robust build than blanked terminals. You can expect that your wire-to-wire connector package is undisturbed during the trip and has maintained its vitality even during your production stages, which is why a lot of our customers has raved about our product for both cheaply-priced and, at the same time, resembles the Molex VersaBlade 6.2mm pitch wire-to-wire product in performance and quality.